Zhang Run, third from left. 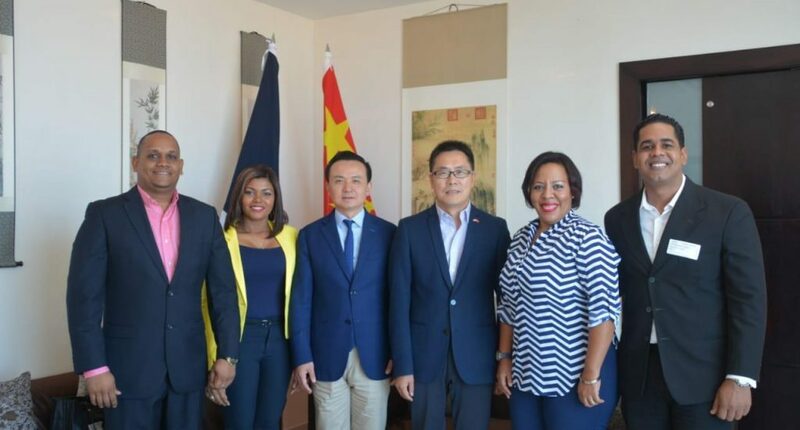 Santo Domingo.- China trade with the Dominican Republic posted its highest growth one year after the two nations forged diplomatic relations, Chinese ambassador, Zhang Run, said Thursday. The diplomat stressed that trade has also sparked an increase in visa application by Dominicans interested in exploring new horizons in the Asian nation. Zhang spoke in a meeting in the Chinese Embassy with a commission of young people headed by Claritza de la Cruz, president of the Institute for Political, Economic and Social Studies of Latin America and the Caribbean (IEPES-LAC). The ambassador cited various projects in the planning stage between the two States in the immediate and long term, as well as cultural activities to raise awareness about Chinese culture in the country.